While it is best to call a professional carpet and furniture cleaning company when you need a spot or stain removed, many homeowners will attempt to do it themselves first. Be very careful when trying to remove a spot or stain from furniture or upholstery, though. Furnishings are often delicate and the fibers can be natural material, like cotton, linen or silk, and can be easily damaged. In addition to that, the colors can bleed or crock off with do-it-yourself furniture cleaning attempts. But if you really must remove a spot from your favorite sofa or chair, be gentle. One thing you can do is use a baby wipe (yes, the same thing you use on the bottoms of your babies). CAREFULLY blot the spot with the baby wipe and the mild "cleaning agent" in the wipe just might do the trick. You can also use baby wipes on the edges of arms if you notice a little soil build-up. One thing you do not want to do is apply too much cleaning product onto spots or stains. This should never be done. All kinds of permanent damage can occur. Do not rub or scrub any spot or stain. Blotting is safest. All it takes is a little aggressive cleaning on your part to do some irreparable damage, and then you regret it. So be careful with your furniture and upholstery... you want it to last a long time. Check this out... discoloration on furniture can happen because of a problem with fire retardants. You don't know about this, and there is no way to predict this can happen. But if you notice weird colors, usually red or pink, on your furniture this may be the reason. Don't blame your cleaning company. This can happen even with humidity and time. Recognizing it is important. If you see it, contact your furniture manufacturer and see what they can do in the way of replacement. Check this out... there was no way to know of this potential problem, which ended up a bleeder. It happens. When you hire a professional cleaning service, the techs do their due diligence and attempt to avoid problems, but sometimes there's nothing you can do to anticipate issues like this. Courtesy Triple S.
Be careful when washing sofa and chair cushion covers! I recently taught an IICRC Advanced Upholstery and Fabric Cleaning Technician workshop and had some 33 cleaning technicians attend. 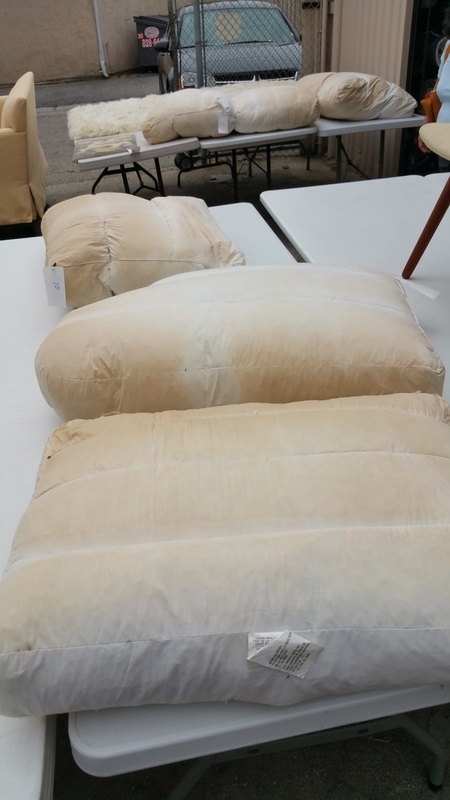 One of the topics we discussed was how some of their customers remove the cushion covers and wash them in their washing machine, put them in the drier and then have the professional cleaning company clean the body of the sofa/loveseat/chair. Of course, if you do this the cushions look pretty nice, but there are some dangers to washing cushions yourself. Here are a few things to keep in mind. 1. When you wash the cushions, there is some danger in shrinkage and dye loss. If this happens, not much you can do to fix it. 2. Shrinkage typically occurs in the drier, so if you are tempted to wash your own cushions, hang them to dry (but remember there is always risk). 3. Dyes are funny things. The dyes on your favorite t-shirt are pretty tough, but on upholstery they can be what professionals call "fugitive dyes" in that they aren't very friendly and can bleed and cause all kinds of problems. So while you may do this, remove your cushion covers for laundering, keep these points in mind and be very careful with your valuable furnishings! P.S. And out of fairness to my fellow cleaning pros, I want to mention that if you do wash your cushion covers, a professional cleaning may not "match" what your cushions look like, for a few reasons. The first is the cushion covers are kept clean while the body of the furniture does wear out a bit and lose its fresh look over time. The second is colors fade a little bit in the washing machine and this can be an illusion of clean... there are other reasons, but please don't blame your cleaning pro if things don't match up perfectly. Your dogs, cats and other cuddly creatures are good for you, but maybe not so good for your furniture or upholstery. Fresh, clean upholstery and furniture is what everyone wants, yet when the pets jump up on them and "do their thing" there could be a problem. Spots, stains and odors are common with upholstery and furniture when pets are involved. Hair is an issue. Brush your dogs or cats often. Loose hair is a problem for carpet and furniture, so keep your pets brushed as often as you can. Dogs and cats that go in and out are a challenge as well. Muddy paws add soil to the home. it is a good idea to place mats inside and outside the door.